Fine Art at Nepean Arts and Design Centre: It's never too late to study art! Diploma of Visual Arts student Ray Atkins has a lovely story in the Parramatta Advertiser this week, talking about the fulfillment studying art has given him. Follow the link, or read the text of the article below. RAY Atkins has travelled a long road to become the art student he wanted to be when he left school. But, at 66, Atkins is just happy to be finally studying fine arts at TAFE, after a lifetime that has seen him close to death, in a variety of jobs and with a marriage under his belt. 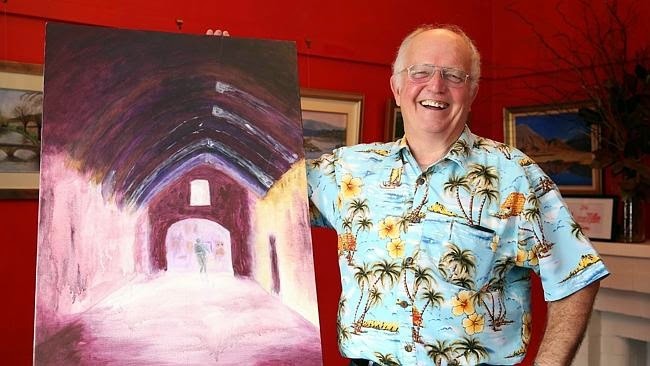 While he has never been far from the paint brush, it was only when he joined Parramatta Art Society in 2009 that he realised art was his first love. He paints abstracts and landscapes. “Getting great encouragement from the society made me think again about studying art, so I enrolled in a fine arts diploma course at Kingswood TAFE, which I am enjoying and I may end up doing the advanced diploma course,” Atkins said. He shrugs off the possibility he may have worked in art, perhaps as a teacher, if he had studied it from a young age. Acting was another possibility but he knocked back an interview with NIDA for reasons that are not clear to him even today. “My mother, who is still alive at 92, still keeps reminding me of that missed opportunity,” he said. But his mother is just glad he survived a horrific car accident when he was 20, causing severe brain damage with the possibility he would have disabilities for life. That accident set him back as he faced years of rehabilitation, facing the prospect of never walking again. But, showing the same determination and sunny nature that sees him enjoying art classes with people of all ages, Atkins bounced back, working as a linesman assistant for a power company and as a an army storeman — all far removed from the creative life. Along the way he married, and divorced. But art still featured in his life and it was while entering in the Blacktown Art Show that he saw a notice about the TAFE art course. “And I haven’t looked back,” he said.